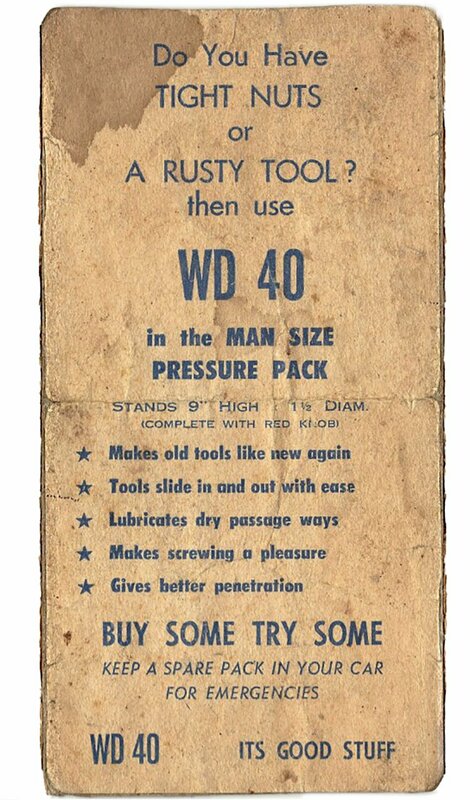 This ‘faux’ WD 40 Vintage Advert has just about made my Friday complete, save for some lubing I have planned for later. The innuendo has been masterfully created to work just seemingly with the true facts of what WD 40 can do for you. Even though it’s fake, I still want to believe this is a real advert from the 1960’s. It’s innuendo at it’s most brazen, but oh my my my, so utterly hilarious. then use WD 40 in the MAN SIZE PRESSURE PACK. BUY SOME TRY SOME. KEEP A SPARE PACK IN YOUR CAR FOR EMERGENCIES.